Thai pomelo and passion fruit salad | Is Life a Recipe? An absolute cracker of a salad and will go with any other dish in my reckoning. Or thrown in some beef and it becomes a meal in its own right. But the day I created this salad it was accompanying a BBQ this day. So smoky and fatty meats that this citrus and sour salad cut right through. Almost like a palate cleanser. Stunning look to it with all the vibrant colours and then the taste – Thai in style as it was zesty, fruity, sharp, sour, salty, spicy, minty, nutty all in one. 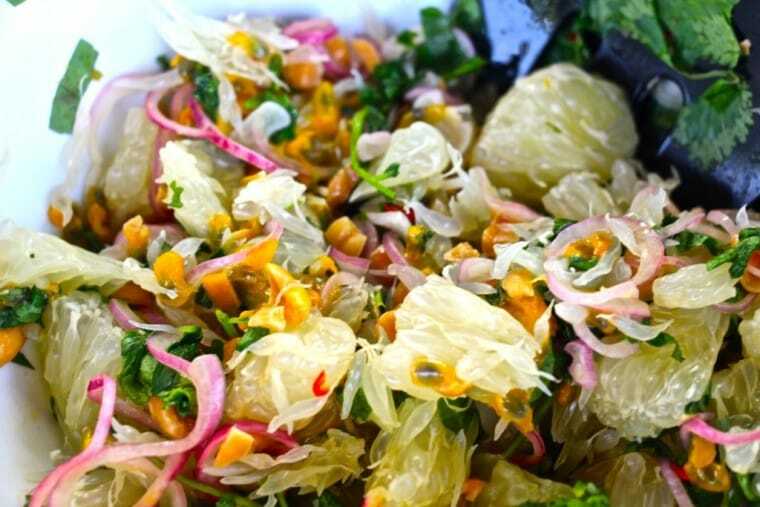 Oh yeah – my kind of salad, my Thai pomelo and passion fruit salad. Don’t mind saying this myself but this was an absolute cracker of a salad. Thai inspired with a little twist with the passion fruit which gave it a really nice fruity acidity and real purdy colours and all that! My Thai pomelo and passion fruit salad, is as usual, kept so so simple with hopefully amazing outcomes. SO just follow the steps my friends, follow the steps. Here we go. Mix these up until the sugar dissolves and stand aside. In to large salad bowl throw all these ingredients. 1 cup of salted peanuts, give this a bash with something hard – chunky not powder. Believe me – I can’t this enough, this is a cracker. PLEASE give this one a go. Here is my Thai pomelo and passion fruit salad. It seriously is a stand out from the crowd. I just know you will like this. And it is easy, you could do this stood on your head, believe me – ENJOY!!! No Replies to "Thai pomelo and passion fruit salad"